More delicious recipes to end summer with a bang! This week’s recipe: Turkey Burger Sliders & Grilled Corn on the Cob with Cilantro Lime Butter. Learn how to make delicious turkey burger sliders using one of Chef Ada’s favorite secrets and a bonus add-on with a unique twist to corn on the cob. Here’s the scoop! Summer is here and what better way to stay cool than with some delicious ice cream. 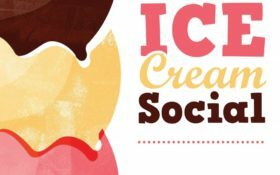 The EPM Ice Cream Social will happen on the fist and third Sundays (did somebody say ‘sundaes’) of July and August — just when ice cream tastes the best. The EFM Kitchen will be crafting their own in-house homemade ice cream with fruits and ingredients sourced from local farms, tropical growers and others for the freshest tasting flavors. Savor the fresh taste of berries from Jose Porter Farm and Trauger’s Farm; tropical fruits from Four Seasons; peaches from Comeback Farm & Scholl Orchards and Scholl’s apples too! And, of course, the traditional vanilla and chocolate ice cream. And don’t forget the toppings like cherries, sprinkles, cookie dough pieces, Oreo cookie pieces, graham cracker pieces, marshmallows with sauces like hot fudge, caramel, Nutella, and a fresh homemade raspberry sauce or peach sauce. So grab some friends, your family or a neighbor and have fun making your own yummy ice cream float, the sundae of your dream, a loaded waffle sandwich, or scoops of your favorite ice cream! More delicious recipes to end summer with a bang! This week’s recipe: Mini Pineapple Upside-Down Cake. If you like cherries and pineapples, why not join Chef Ada in baking this scrumptious dessert? Learn the layers of this popular mini dessert. Easton Hospital presents Healthy Living Wednesdays in the EPM Kitchen! Meet Nutritionists Alison Unger and Amy Romberger and learn about eating healthy throughout the year as they share tips and recipes on how to promote a healthy lifestyle. Join them on August 15th for a cooking demo, “Summer Brunch Alternatives,” with mini zucchini quiches and eggplant bacon. The group will also learn about the nutritional benefits of summer produce ingredients. 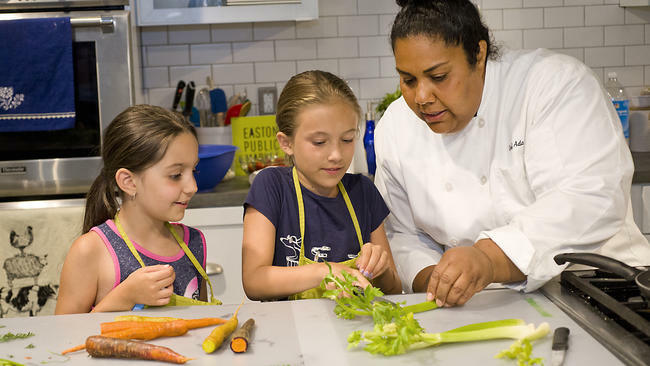 Kids in the Kitchen with Chef Ada – SOLD OUT! More delicious recipes to end summer with a bang! This week’s recipe: Pizza Margherita Grilled Cheese. If you love pizza and grilled cheese, this class is perfect for you. We will be combining the two by stuffing our grilled cheese full of mozzarella with tomato sauce and basil.